We got Tooey’s biopsy results from the vet yesterday. That mass they removed from her teat last week? It’s a benign dermal hemangioma. I feel like we dodged a bullet. 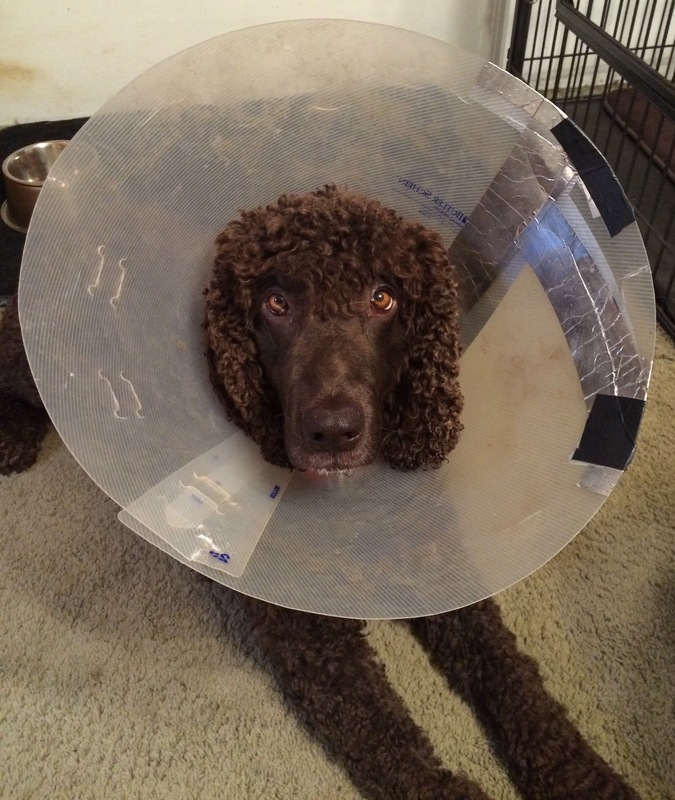 Tooey wishes we would please take this stupid cone off now. I know this because she still, after a week of wearing the thing, bashes it into doorways, chairs, the bed, the outdoor furniture, the patio cover supports, etc. 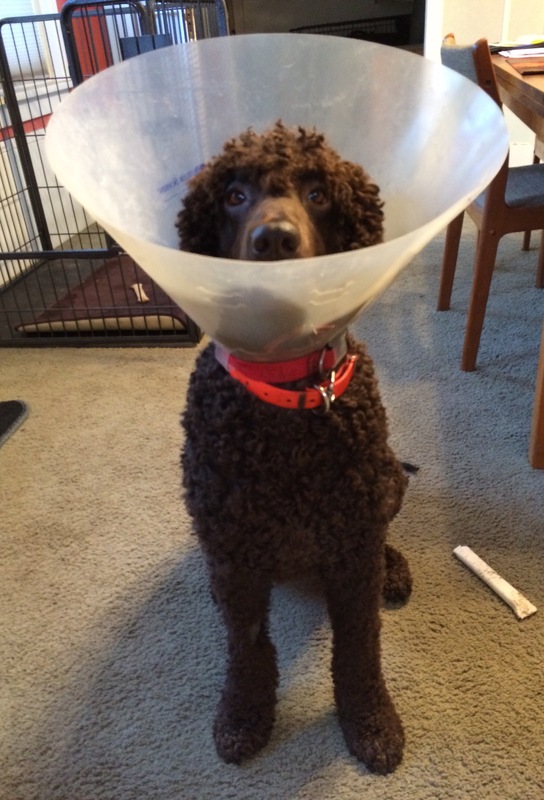 It seems like every day we come home to new repairs needed on the stupid cone. Bug hey, that is small potatoes. The mass is benign. That’s what counts. Yesterday afternoon, while walking leashed down the sidewalk, Carlin was attacked by an Alaskan Malamute. The Malamute, twice Carlin’s weight, charged down the adjacent driveway and jumped Carlin. When Russ or I have walked the dogs around the neighborhood, we’ve seen this dog loose in his yard before, and always walked down the other side of the street. But yesterday, Carlin was being walked by our dog walker, who doesn’t live in this neighborhood, doesn’t often walk down that street, and had forgotten about that Malamute. The dog walker brought Carlin right home, and reported the incident to us. At first, we didn’t see any damage beyond a broken nail. But by this morning, it was clear that something was wrong with Carlin’s left ear. Yesterday, he winced when it was touched, but this morning, he screamed. Closer inspection revealed some yucky fluid in the ear. So, off he went to the vet. The vet sedated him, and went investigating. What they found was an infected 4mm puncture wound in his ear canal. He’s being treated with antibiotics, pain medication, and ear drops. 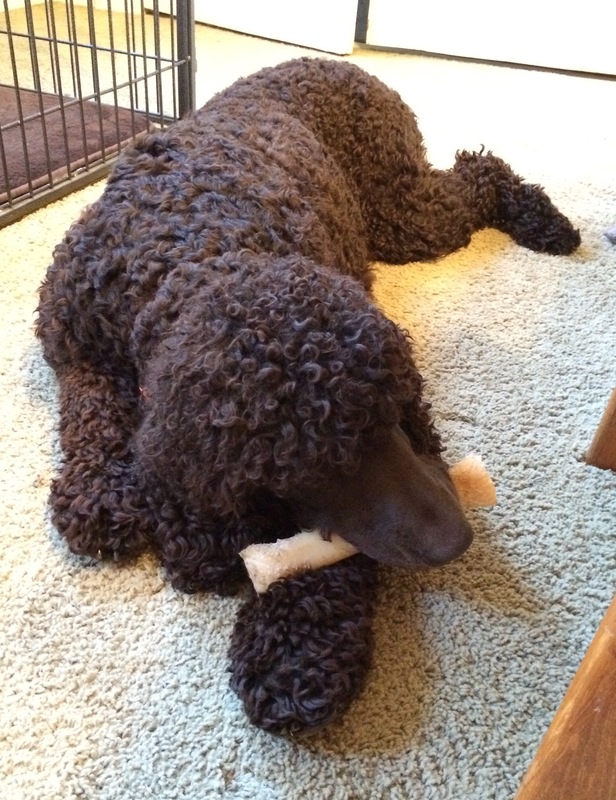 When Carlin got home from the vet, he walked loopily into the house, got his favorite nylabone, lay down, and went to sleep with the bone in his mouth. Tooey is recovering, too, from her mammary surgery on Tuesday, so the two of them are recovering together. What we’re going to do about the Malamute and his owner — we’re not sure. It complicates things that neither of us was there when the attack actually happened, so we’ll see. Patience! It’ll all be better soon, Girlie Girl. You had that surgery only yesterday. It will be better soon. I’m sure of it. Tooey is going in for surgery today. I am always concerned about my dogs when some health issue comes up, but this one is worrying. Especially with Cooper just having died with cancer, I am really hoping and praying that the new mass on one of Tooey’s teats is benign. You can see the translucent grey swelling on the affected teat in picture below. To compare this to a healthy teat, look at the second photo. 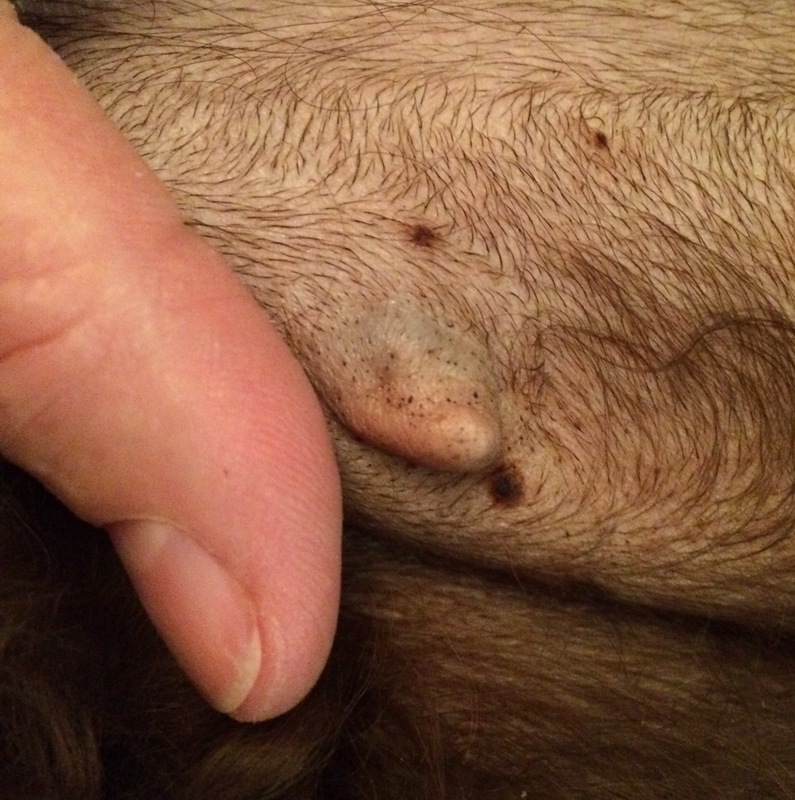 About a year ago, Tooey had a benign cyst removed from her back. So, she does have a history of benign masses. The difference is that this new mass grew so quickly — in just a month — whereas the cyst on her back took years to grow. So, Tooey is going in today so they can remove the teat and the related mammary gland. The vet will then send the tissue off to be biopsied to see if they are benign. Or not. I thought I’d create a post that lists Carlin’s scores for the four Junior Hunter Upland spaniel tests he took and passed, earning his JHU title. Each test is represented in a table, and each table includes the scores given by the two judges for each category. This morning, the Greater Pacific Northwest Retriever Trial Club put on a lovely small hunt test. It was especially lovely because this, the last of the local hunt tests this year, was the test where Carlin and I passed his first retriever Junior hunt test. Because Russ was gunning for the test, we got to St. Louis Ponds nice and early, while it was still cool. Carlin and I ran last (number 11), so while Russ was helping out, I “aired” the dogs and myself, drank some water, and waited while the judges, bird boys, and gunners got themselves organized. As in all retriever Junior tests, there were four birds to be retrieved: two ducks on land and two on water. And as with many Junior tests, the judges of this test, who also judged the Senior-level dogs yesterday, used almost the same marked retrieves for the Juniors as they had for the Seniors. Almost, but not quite. The first difference was that the Seniors ran the marks as doubles, whereas the Junior ran them as singles. The second difference was that starting line for the Junior dogs’ land marks was actually moved back farther away from the areas of the fall by about 5 yards, making the Junior marks longer than the Seniors’ marks. The first mark was about 65 yards away. The dog had to cross a shallow ditch, run through some taller cover, and find the bird in a patch of mint. I held on to Carlin’s collar and signaled for the bird. The bird flew, came down and landed, and then three v-e-r-y long beats later, the judge said “11.” Fortunately, Carlin had stayed sitting, so all I had to do was say, “Take It!” — our command for him to go out and retrieve the bird. But did I say “Take It”? No. I said “Dog.” Sometimes, some judges don’t call the dog’s number, they just say “Dog.” I’ve listened to judges say this during Cooper’s and Tooey’s retriever tests for years, and “Dog” is just what came out of my mouth. And when I said, “Dog,” Carlin took off for the bird. Now, if this had been practice, I’d have stopped him for leaving on any command other than “Take It.” But this wasn’t training — it was a test. I let him go. Carlin, like his uncle Cooper, is a very good marker. He saw exactly where that bird fell and ran straight out to it. His nose went down, so I know he found it. He poked it a couple of times. Finally, I came to my senses and whistled him to come in. Fortunately, he picked up the bird and came back to me with it. The second land mark was about 75 yards away, with the live flyer falling into a patch of 8″ inch tall grasses. What made this mark tough for some of the dogs was that it was in an area of dappled shade in front of a stand of trees. Those dapples and dark trees confused some of the dogs, but not Carlin. He ran straight out to that one, too. He poked it a couple of times, and then looked up. Tweet! Tweet! Tweet! Tweet! This time, I was marginally faster at whistling him in. He picked this one up, too, and delivered it to hand. So, we were called on to the water. The water marks were about 80 yards. The start line was up on a sloped five foot bank, and the dog was to run down the bank, swim diagonally across the pond, go up onto the opposing bank, and pick up the bird. The first water mark had the bird falling at the water’s edge, and the second falling into some 16″ cover about 10 feet up the bank. As usual, Carlin put on a show with his water entry. Very enthusiastic. I could hear appreciative comments from the judges as I watched him swim diagonally across the pond toward his first water bird. The bird had landed on the shore, but by the time Carlin got there, it had rolled into the water. Carlin was (reportedly) the only dog to swim directly to the bird, rather than searching the bank. He snatched it up and turned to swim back with it. He didn’t swim quite straight back to me, though. For a few yards, he was seriously considering swimming out in a perpendicular line to the bank, instead of diagonally across the pond. This would have meant that he would then have had to run the bank back to me. But fortunately, at some whistling from me, he changed his mind and corrected his line to be more diagonal again. That meant that he had to drag his duck through a tree limb floating in the water, but he did it. When he got back to the bank, I could see that he had the duck by one wing. I told him to Hold it, but instead he dropped it, got a better grip, and then delivered that bird to hand. By this time, he was amped and more than ready to go. I lowered my voice on my third command to “Sit,” and he finally sat. Once he sat, I could call for the bird. His last bird was launched and fell about 10 feet up the opposite bank into a patch of 16″ tall cover of grasses and other little bushes. Fortunately, while the bird was in the air, he stayed sitting, and when the judge called “11,” I said “Take It,” and he was off. He swam straight toward the duck, dashed up the bank and found his bird in the cover. Before he could stop and poke at it, I whistled him back in. He grabbed the bird, and did the nicest water entry he could do with a duck in his mouth. This was another diagonal swim, which he did quickly. He came up the bank, and delivered the bird to hand, and we were done. As we left the line, one of the judges said, “Nice job,” and I knew we had passed. After Tooey’s “most perfect failure” at a hunt test a few weeks back, I decided that it is futile and annoying to enter my favorite girl-dog into a venue where she doesn’t really shine. Over the four days of the Labor Day Spaniel hunt tests where Carlin was our star, Ms. Tooey just went along for a ride and quietly waited in the car while gun-shots, dogs, and birds where flying everywhere. On Saturday, our friend Norm, and Tooey’s hunting partner, the Boykin Spaniel Scarlett, joined us to watch Carlin show his flash in the field. After the tests were done, Norm and I took Tooey and Scarlett for a walk through the fields, and we headed over to the area where the Master and Senior tests had been held. Our two brown dogs, who have often hunted in a brace together, started quartering the field and heavy cover in their distinctive styles. Tooey quietly searched the perimeter and heavy cover while Scarlett quartered through the tall grass, popping up occasionally to check her orientation to Norm. Even though these fields had been traversed by a couple of dozen hunting dogs earlier in the day, there was still a chance of finding a bird that had successfully eluded the flushing dogs and gunners. Tooey began searching with her methodical, very thorough, and deliberate technique. This is the very style that bounced her from the last hunt test because it doesn’t conform to the written standard “hunting style” of an Irish Water Spaniel. Unfortunately for the birds, Tooey’s non-standard style is incredibly effective. Within moments of starting out, she flushed a chukar that thought that by flying 50 yards and hiding in a bush, it was safe. Safe from the shotguns maybe, but not Tooey’s eyesight and nose. A bird in the bush is a bird in the hand for my hunting dog. Tooey tracked the flushed chukar into the bush, snatched it, and returned it alive to hand. No sooner than I put the chukar in my vest, Tooey stopped, stepped to the side, and picked up a pheasant that had been shot during the morning’s test but had been unretrieved by the Master or Senior dog that had put it in the air. One more bird for the vest. As our dogs continued to search more cover, Tooey did a double-take on some dense grass, spun around, and up flew a pair of pheasants. If I had been carrying my shotgun instead of a camera, I could have had my daily limit in one flush. If I had been carrying a whistle, I would not have had to raise my voice and say “No Bird!” My steady girl watched two birds fly away, much to her chagrin. My dearest Tooey, sometimes judged a failure, brought me a chukar, a pheasant, and put four more pheasants in the air — all birds that had previously eluded Spaniels with the correct hunting styles.